At holiday time, the world literally lights up. In homes, along our streets, in front yards, each family decorates in a way that reflects what the holiday means to them, and how they celebrate it. Those with children might incorporate huge, lit inflatables that seem to wave to passers-by as the wind blows. Others may illustrate their faith more traditionally with a nativity scene passed down through their family. Prior to the mid-19th century, Americans observed Christmas in manners they’d brought over from their home countries. Christians typically kept the holiday quiet and personal; there was no outward celebrating. The Germans, however, had been bringing Christmas trees into their homes since the 16th century as well as lighting candles. The ritual made its way to England where the trees were decorated with candies and fruits, dolls, small musical instruments and jewelry. When a Christmas tree was erected in Pennsylvania in 1830, though, it was looked at as more of an oddity than anything else. Even though it was used as a means to solicit donations for the town’s church, some non-Germans viewed it as pagan and wanted it taken down. to spread word of the little-known custom. Vast immigration saw the growth of Northern villages to industrial towns. “At this crossroads of progress and nostalgia, Americans found in Christmas a holiday that ministered to their needs. The many Christmases celebrated across the land began to resolve into a more singular and widely celebrated home holiday,” historytoday.com adds. “It became a moment of idealized national self-definition. “At first, the decoration of these fragrant evergreens reflected the whim of folk tradition. Celebrants added nuts, strings of popcorn or beads, oranges, lemons, candies and homemade trinkets.” Some also wired tapered candles to the branches. By 1870 or so, Christmas trees – typically spruce, pine or fir – were being sold to the consumer, as were ornaments imported from Germany. Brightly colored glass balls, wax angels with glass wings and cut tin decorations were replacing handmade items. Then the advent of electricity replaced candles with bright lights that could be left on for longer periods of time. By 1900, one American in five was estimated to have a Christmas tree. The next two decades saw Japan and the Czech Republic facing off against Germany and its command of the ornament market. They produced more and fancier decorations. 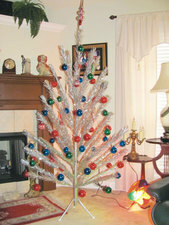 “By 1935, more than 250 million Christmas tree ornaments were being imported to America,” holidayspot.com says. The first artificial Christmas trees were manufactured in 1930 by Addis Brush Company, their branches made from brush bristles. Aluminum trees were introduced in 1958, produced in Chicago, IL, and Manitowoc, WI. The 21st century is seeing fiber-optic, holographic mylar and just about every color artificial tree. Pre-strung, remote-controlled LED lights, flocked branches to simulate snow, the eye glazes over trying to take it all in. • North Carolina has an estimated 50 million Fraser fir Christmas trees growing on over 25,000 acres. • Fraser fir represents over 90 percent of all species grown in North Carolina. • Fraser fir is grown in the far western North Carolina counties, which include Alleghany, Ashe, Avery, Buncombe, Haywood, Henderson, Jackson, Macon, Madison, Mitchell, Swain, Transylvania, Watauga and Yancey. • There are more than 1,600 North Carolina growers. • The North Carolina Christmas Tree industry is ranked second in the nation in number of trees harvested and cash receipts. • North Carolina produces over 19 percent of the real Christmas trees in the U.S.
• The North Carolina Fraser fir has been judged the nation’s best through a contest sponsored by the National Christmas Tree Association and chosen for the official White House Christmas tree 12 times (more than any other species): in 1971, ‘73, ‘82, ‘84, ‘90, ‘93, ‘95, ‘97, 2005, ‘07, ‘08 and ‘12. 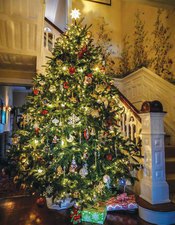 • The North Carolina Fraser fir Christmas tree is the most popular Christmas tree in North America and is shipped into every state in the U.S. as well as the Caribbean Islands, Mexico, Canada, Bermuda, Japan and other points all over the world. • There are approximately 400 choose & cut Christmas tree farms in North Carolina. Real or artificial, the Christmas tree industry has become a multi-million-dollar business. 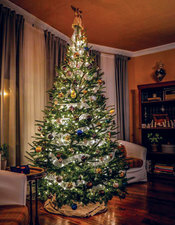 In 2013, more than 33 million live Christmas trees were sold in the U.S. compared to 14.7 million artificial trees, according to statista.com. Today, the Christmas tree stands as a centerpiece for faith, love, peace and family. Its adornments sacred to the season, it radiates tradition from each of its sparkling lights. Merry Christmas!